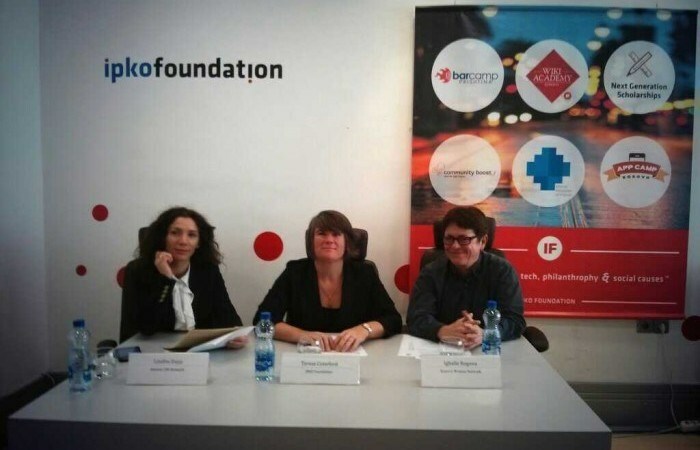 IPKO Foundation is pleased to announce a 5,000 Euro investment in the Kosova Women’s Network’s (KWN) new grant and scholarship fund. This investment is in line with our commitment to encourage greater philanthropy in Kosovo and more support for women’s initiatives and girls’ education. This investment builds on awards of 48 scholarships for young women – 49% of all awards – since 2012 as part of our Next Generation Scholars and our commitment to ensuring access, support and opportunity for women in the tech, innovation, education and business fields. Various potential areas for future cooperation were discussed during the meeting. Igballe Rogova, KWN Executive Director, pointed out that the KWN is working on empowering young women through their Women’s Empowerment Initiative, adding that in order to reach the goal, ways to support women’s education should be found. This is where our two organizations will cooperate – the KWN will use some of IF’s support to fund scholarships through the Foundation for the Education of Girls “Çifti Buçinca”. KWN has 93 member organizations, many of which have no access to donors, therefore the rest of the IF grant will go towards the KWN small grants program to support their work. “Unique is that most of them are grassroots’ organizations working in their communities”, said Rogova. This cooperation strengthens both organizations’ aim to support women’s position in society, stimulating more local philanthropy, growing corporate and individual philanthropy and easing girls hardship when families have difficult economic times. Since December 2012, the Kosovo Women’s Network has provided 20 grants to its member organizations through the Kosovo Women’s Fund, totaling €29,026. The new partnership extends to more than just money. IPKO Foundation will be engaging our past students and Next Generation scholars in assisting KWN members, such as by providing technology workshops. “Some of our scholars could hold informative sessions about technology and using social media for promoting work and activities,” said IF Program Manager Abetare Gojani. With the purpose of informing the public and inviting other organizations to donate, a Press Conference was jointly organized by IPKO Foundation, Kosovo CSR Network, and Kosova Women Network on 23 October 2013. During the conference, Executive Director of Kosovo CSR Network, Lindita Daija stated that the engagement of Kosovar companies in CSR practices is of a crucial importance. On the other side, Teresa Crawford, board member of IF, added that similar contributions match the foundation’s work in encouraging philanthropy in Kosovo and support the development of kosovar society. Igballe Rogova, representative of KWN, expressing her gratitude for the donation, she mentioned different potential fields of network where contributions such as this are crucial. “This was an important step towards the promotion of women’s rights and empowerment” – Rogova stated. Future potential projects between these three organization to further their structural cooperation were discussed. As such, it is expected that soon valuable activities will be initiated by an enhanced cooperation of these three organizations. We encourage others to donate to the KWN girls education scholarship program and their small grants program. You can learn more about the KWN member grant fund here and learn how to donate to the KWN here.